Asparagus will grow best in an open and sunny site, but will just about deal with dappled shade if you don’t have the luxury of constant sun. It’ll grow in most soil types, but you should aim for a pH of between 6.5 and 7.5. If you’ve got particularly acidic soil then it’s probably worth giving it some lime before you start. Always choose a new bed when planting asparagus, as using an old asparagus bed increases the risk of disease build-up. Prior to planting, ensure you’ve completely removed any perennial weeds, and incorporate at least one bucketful of organic matter such as good compost or well-rotted manure. Do this for every square metre of your bed. Dig a trench around 30cm wide and 20cm deep, working in manure to the base of the trench. You can then cover the base with around 5cm of the excavated soil. Create a ridge of soil around 10cm wide down the centre of the trench, placing the crowns on the top. Plants will need to be placed in the soil between 30 and 45cm apart, with the roots spread evenly. Cover the plants with the previously excavated soil, leaving the bud tips to poke through, only just visible. Water in and mulch around 5cm more manure to help foster growth. Asparagus plants are either male or female. Male plants produce more spears that are better quality, so many modern cultivars are selectively bred to be all-male. If any female plants do appear, they will be noticeable because they produce orange-red berries. If you are growing an all-male cultivar, you will need to remove any female plants as well as any seedlings that appear. 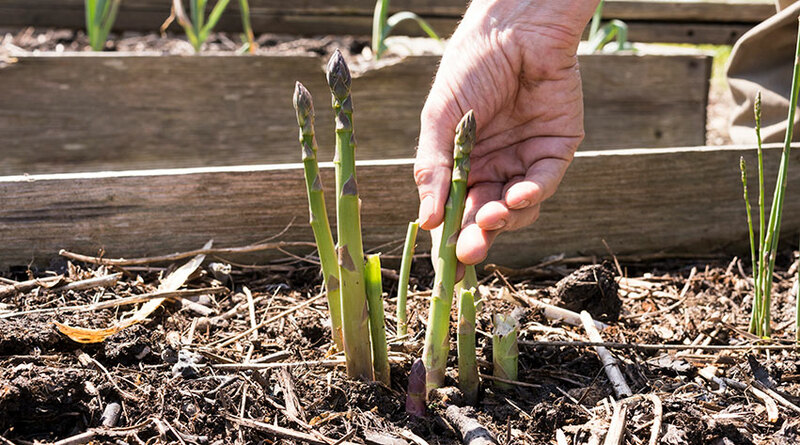 Be sure to hand-weed rather than hoe the asparagus bed as shallow roots are easily damaged. You should also mulch the bed in late winter with weed-free compost to discourage weeds and to help retain moisture. In early spring, apply 100g per sqm of general fertiliser, or fish, blood and bone. You can repeat this process once harvesting is finished if growth is weak. To avoid the top-growth breaking in windy weather and damaging the crowns, use stakes and garden twine to make a ‘fence’ either side of the row for support. Asparagus is a “pay off later” plant that takes a bit of patience to grow – so you shouldn’t harvest for the first two years after planting. In the third year, you can harvest the spears from mid-April for around six weeks, and in subsequent years you’ll have around eight weeks to get them up. To harvest asparagus, simply cut individual spears with a sharp knife of around 2.5cm below the soil when they’ve reached around 16cm tall. Once the weather gets warm, harvest every two or three days. Slugs and snails feed on young asparagus seedlings. A tell-tale slime trail will be evident if your plants are affected by these common garden pests. Sawdust, eggshell barriers, copper tape and biocontrol are all useful remedies if you have a slimy problem in your garden. The asparagus beetle can also be a problem. Adult beetles and their larvae strip bark from the stem, leaving damaged areas yellow-brown and desiccated. In late spring the pests can be destroyed by hand, while beetles can be remedied by burning old stems at the end of the winter. The long growth time of the asparagus means you’ll have to be particularly careful of frosts, which can damage growth and kill off your plants. Remove any damaged growth and protect the bed with a double layer of horticultural fleece if frost is forecast.